This module will give farmers inputs about different ways to reach target groups and stakeholders in order to promote the educational activities on your farm. In this unit you will learn the basics of marketing for farmers. At the end of the unit you will know how to determine what people want, how to plan and provide products and services to meet those wants, and how to select the most effective ways of reaching those who might pay for these products and services. At the end of this unit you should be able to select the right audience for your on-farm services and communicate with them in a propriete way. The unit will teach you how to promote your on-farm event using public and media relations, and other communication tools. How to create and implement a marketing plan for your farm. How to select the right audience for yor on-farm services. How to use communication tools in order to promote your on-farm event. There are obvious marketing opportunities associated with farm visits and on-farm education. 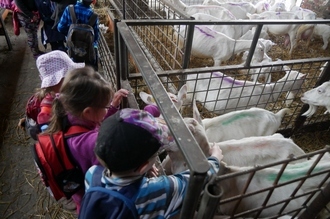 Farm walks and open days not only provide an opportunity to educate the public but also to generate additional customers and relatively cheap publicity. Extra income directly derived from educational visits is quite small. However, the other benefits are not inconsequential, and can be capitalised on. Income can also be generated by adding value to visits by providing catering or other facilities.